F‑TYPE and F‑TYPE R models feature Intuitive All Wheel Drive with Intelligent Driveline Dynamics by Jaguar, offering balanced poise and confident handling. A strong, lightweight aluminum body is the perfect platform for a sports car. It allows the finely tuned double wishbone suspension of the F‑TYPE to deliver precise control and is the perfect complement to the high performance engine range. Derived from motorsport technology, the optional Carbon Ceramic Matrix Braking system is the most powerfully performing braking system ever fitted to a Jaguar road car and features 6-piston front and 4-piston rear brake calipers and exclusive 20-inch forged alloy wheels. The F‑TYPE roars right from its heart. Its Sport Exhaust growls powerfully from start-up, building to a race-car-inspired crescendo. An Active Sport Exhaust, standard on the F‑TYPE S and R, uses Active Bypass Valves to allow exhaust gases to exit more directly for a deep, dramatic sound. A driver-selectable Active Exhaust with manual control is standard on all manual transmission models and on the F‑TYPE R and SVR, as well as an option on the F‑TYPE Premium with automatic transmissions. Even at night, the F-TYPE stands out. 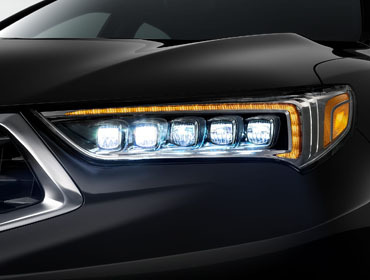 Standard LED headlights featuring LED 'J' blade Daytime Running Lights are as powerful as they look. 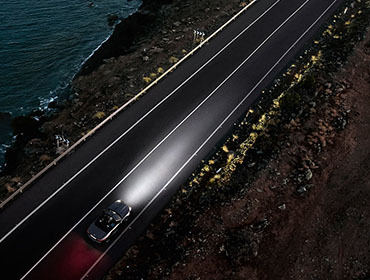 These elegant headlights adapt the width and depth of their beam to your speed and offer a quality close to daylight. You always have the best possible illumination whatever your surroundings, helping your eyes distinguish objects more easily and reducing fatigue. Aluminum: The aluminum roof is as strong and lightweight as the rest of the vehicle. It provides the ideal complement in color, style and line to the powerful F-TYPE profile. Panoramic Glass: A full-width panoramic roof on coupe models introduces even more natural light and airiness to the interior, for increased seclusion, the roof features a manually sliding 'black-out' blind. Carbon Fiber: With carbon fiber outer and inner panels bonded together to create a strong yet light roof structure, the optional carbon fiber roof on Coupe models. Jewel Eye® LED headlights mimic natural sunlight to provide a whiter, brighter beam. 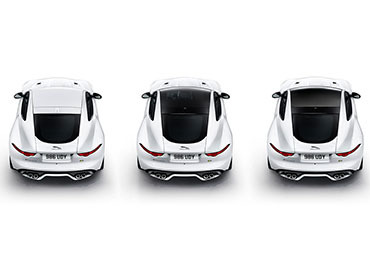 The F-TYPE starts with quintessential British character, but its ultimate personality is up to you. The choices you make create the car you'll love. Tailor your choices from different seat options, specifying the textures and color combinations. In the F-TYPE, you and the car become one. Every aspect of its 1+1 configuration is designed to create a bond. It wraps around you, taking your driving experience to greater heights. Push the start button and the F-TYPE comes alive with a cascade of light from the console's switchgear. Configurable Lighting, standard on the F-TYPE R and SVR, adds unique personalization with choices of Phosphor Blue, Pale Blue, White, Coral or Red to suit your mood. Activate Dynamic Mode and the lighting switches to vibrant red on the door grab handles, center console and instrument cluster. InControl Remote™ enables you to monitor your F‑TYPE through your smartphone. It also allows you to track journeys, remotely lock/unlock your car, as well as remotely start the engine to heat or cool the cabin (remote start on automatic transmissions only). A powerful audio system brings the F‑TYPE cockpit to life with 8 speakers and 2 subwoofers. And the optional 770W system, with 10 speakers and 2 subwoofers, that delivers concert hall acoustics using Meridian's exclusive Trifield™ technology. This safety feature is designed to help protect Convertible occupants in the event of a rollover. Finished in Gloss Black with the black pack, the rollover protection system is also available with Carbon Fiber. If the brakes are applied rapidly, this system is designed to boost braking force to the maximum for shorter stopping distances. It can also help retain greater steering control in unexpected situations. Two front airbags and two side airbags help provide added reassurance for you and your passenger.6 Sensors detect the size and weight of the driver and passenger and direct the front airbags to deploy appropriately. Advanced seatbelt pretensioners automatically tighten the seatbelts when they sense rapid deceleration. Available Rear Traffic Monitor uses radar system to warn of oncoming vehicles in your path as you back up, such as when reversing out of a parking space.